When Putin was last elected, Washington was able to use its Fifth Columns to pour thousands of protesters into the streets of Russia claiming that Putin had “stolen the election.” This American propaganda had no effect on Russia, where the citizen back their president by 89%. The other 11% consists almost entirely of Russians who believe Putin is too soft toward the West’s aggression. This minority supports Putin as well. They only want him to be tougher. The actual percentage of the population that Washington has been able to turn into treasonous agents is only 2-3 percent of the population. These traitors are the “Westerners,” the “Atlantic integrationists,” who are willing for their country to be an American vassal state in exchange for money. Paid to them, of course. But Washington’s ability to put its Fifth Columns into the streets of Moscow had an effect on insouciant Americans and Europeans. Many Westerners today believe that Putin stole his election and is intent on using his office to rebuild the Soviet Empire and to crush the West. Not that crushing the West would be a difficult thing to do. The West has pretty much already crushed itself. China, obsessed with becoming rich, has been an easy mark for Washington. The Rockefeller Foundation is supporting pro-American Chinese professors in the universities. US corporations operating in China create superfluous “boards” to which the relatives of the ruling political class are appointed and paid high “directors’s fees.” This compromises the loyalty of the Chinese ruling class. Hoping to have compromised the Chinese ruling class with money, Washington then launched its Hong Kong NGOs in protests, hoping that the protests would spread into China and that the ruling class, bought with American money, would be slow to see the danger. Russia and China finally caught on. It is amazing that the governments of the two countries that Washington regards as “threats” were so tolerant of foreign-financed NGOs for so long. 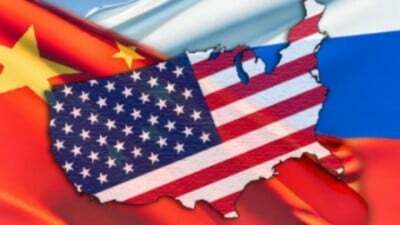 The Russian and Chinese toleration of Washington’s Fifth Columns must have greatly encouraged the American neoconservatives, thus pushing the world closer to conflict. We Americans need to be humble, not arrogant. We need to acknowledge that American living standards, except for the favored One Percent, are in long-term decline and have been for two decades. If life on earth is to continue, Americans need to understand that it is not Russia and China, any more than it was Saddam Hussein, Gaddafi, Assad, Yemen, Pakistan, and Somalia, that are threats to the US. The threat to the US resides entirely in the crazed neoconservative ideology of Washington’s hegemony over the world and over the American people. This arrogant goal commits the US and its vassal states to nuclear war. If Americans were to wake up, would they be able to do anything about their out-of-control-government? Are Europeans, having experienced the devastating results of World War I and World War II, capable of understanding that the incredible damage done to Europe in those wars is minuscule compared to the damage from nuclear war? If the EU were an intelligent and independent government, the EU would absolutely forbid any member country from hosting a US anti-ballistic missile or any other military base anywhere close to Russia’s borders. The Eastern European lobby groups in Washington want revenge on the Soviet Union, an entity that is no longer with us. The hatred transmits to Russia. Russia has done nothing except to have failed to read the Wolfowitz Doctrine and to realize that Washington intends to rule the world, which requires prevailing over Russia and China.